LEXINGTON, Ky. (Aug. 6, 2014) – The Louisville Ironman – a triathlon consisting of a 2.4-mile swim in the Ohio River, a 112-mile bike ride, and a 26.2-mile run – is a competition that would test even the toughest of wills. 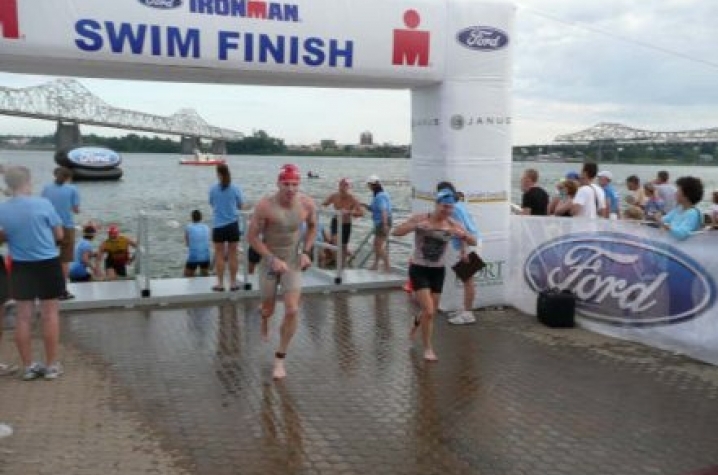 But for University of Kentucky radiation oncologist Dr. Jonathan Feddock, the competition is about more than achieving a personal goal – Feddock, an accomplished triathlete, is using his athletic talents to help provide better care for the cancer patients he treats. When he competes in the Aug. 24 Ironman, he'll be doing so to raise money to pay for renovations and updates to the brachytherapy program at the UK Markey Cancer Center. Brachytherapy is a specific form of radiation treatment where radiation sources are placed inside or close to the area requiring treatment. The total estimated cost for the brachytherapy project is approximately $1.2 million dollars, and Feddock has a specific goal to reach – he is trying to raise $200,000, with the remaining $1 million to be matched through the University, independent philanthropists, and department funds. The proposed changes would consolidate all areas involving brachytherapy, including moving the implant procedure room and the radiation treatment room into a combined space, and upgrading the current brachytherapy equipment. Brachytherapy treatment is commonly used to treat most gynecologic cancers, as well as malignancies of the breast, prostate, and skin. Under Feddock’s leadership, the radiation medicine department has developed a niche practice that uses brachytherapy for recurrent tumors in patients who have previously received radiation. As a result, UK sees patients from all over the country. Unfortunately, Kentucky holds the distinction of having some of the highest cancer rates in the country – including being No. 8 in the U.S. for cervical cancer incidence. The availability of brachytherapy in the state is limited, and as a result, Markey provides brachytherapy services for essentially all patients coming from central, eastern and southern Kentucky. Currently, Markey patients receive their brachytherapy implants in the Ben F. Roach Building, but have to be transported down a long hallway to the radiation treatment room in the UK Albert B. Chandler Hospital. Because the radiation therapy treatment and recovery rooms require a shielded vault, consolidation is not an easy process. However, Feddock points out, the renovations will improve staff efficiency and the overall patient experience, in addition to allowing his team to see even more patients per day. "Currently, the setup and logistics of brachytherapy treatment limit me to no more than two cases a day," Feddock said. "As our patient population grows, there's a real need to streamline the process so we can see more patients. I believe the proposed changes would allow me to treat three to four patients a day." Feddock is determined to reach his goal, and he's even implemented a clever strategy to bring in donations. After speaking with members of the World Triathlon Corporation, he has been given special permission to begin the Ironman in Louisville this year in last place – and he's encouraging donors to "bet against him" by pledging a small amount for every single person he passes in the race. With close to 3,000 competitors ahead of him, that's a lot of potential donations. 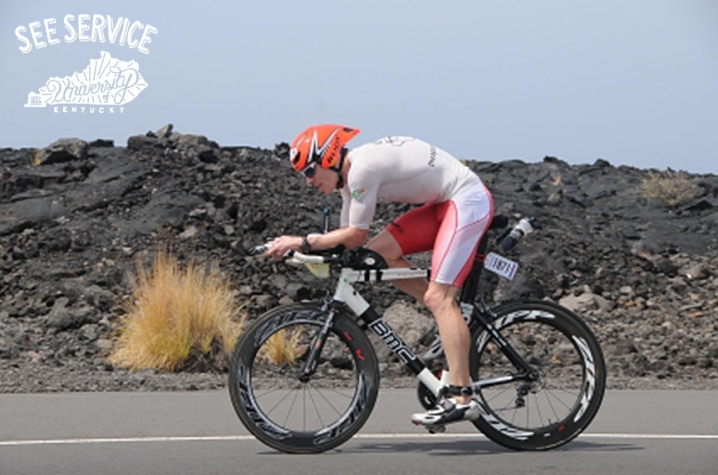 The plan becomes more impressive when you look at his track record: in 2011, Feddock finished 30th in the Ironman; in 2013, he finished 17th. ”While I'm approaching some corporate sponsors and individual philanthropists about making larger donations, I think crowdfunding is the key here," Feddock said. "Every single dollar helps, and if a lot of different people contribute just a small amount, it will add up. By pledging even a small donation, you'll be making a huge impact on cancer care for women and men across Kentucky." Dr. Marcus Randall, chair of the Department of Radiation Medicine, says his team fully supports Feddock's undertaking. To support Feddock's mission and improve patient care at the UK Markey Cancer Center, visit his personal fundraising page, Ironcology.net for details on how to donate. All donations are processed through the Markey Cancer Foundation.